Euglenoids are able to assimilate fatty acids and alcohols with various carbon-chain lengths, and ethanol is known to be one of the best carbon sources to support the growth of Euglena gracilis. Ethanol is first oxidized to acetate by the sequential reactions of alcohol dehydrogenase and acetaldehyde dehydrogenase in the mitochondria, and then converted to acetyl coenzyme A (acetyl-CoA). Acetyl-CoA is metabolized through the glyoxylate cycle which is a modified tricarboxylic acid (TCA) cycle in which isocitrate lyase (ICL) and malate synthase (MS) function to bypass the two decarboxylation steps of the TCA cycle, enabling the net synthesis of carbohydrates from C2 compounds. 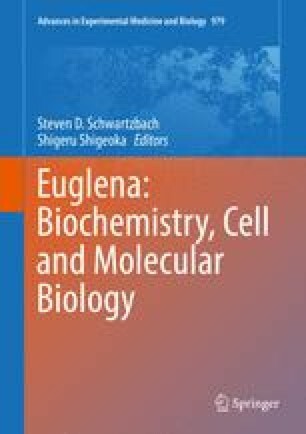 ICL and MS form a unique bifunctional enzyme localized in Euglena mitochondria, not in glyoxysome as in other eukaryotes. The unique glyoxylate and glycolate metabolism during photorespiration is also discussed in this chapter. The author thanks Dr. Hiroshi Inui and Dr. Akiho Yokota for their critical reading of the manuscript.